Item421 - York 14. Plan of new Suburban Lots in York Townsite by F.T. Gregory. Also Lots by G.H. Roe [scale: 10 chains to an inch]. Item422 - York 14A. Townsite plan of York showing Suburban Allotments in vicinity of Avon River, Pool & Newcastle Streets by William Phelps 8/1860 [unsigned, probably by R. Austen, scale: 4 chains to an inch]. Item423 - York 14. 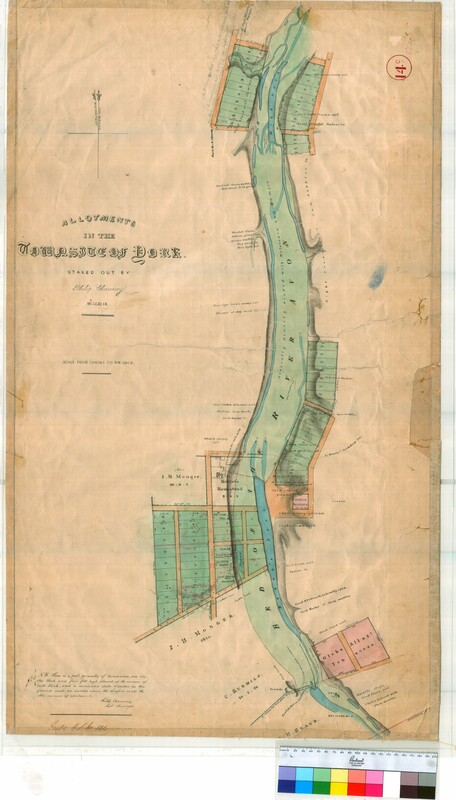 Plan of new Suburban Lots in York Townsite by F.T. Gregory. Also Lots by G.H. Roe [scale: 10 chains to an inch]. Item424 - York 14B. Plan of Townsite of York showing Lots bounded by Herbert Road, Newcastle, Lincoln & Brook Streets by W. Phelps, Location 80 by C. Evans [scale : 4 chains to an inch]. Item425 - York 14C. Allotments in vicinity of York by Philip Chauncy. (Lots in vicinity of South & Poole Streets, Court House, Survey Office, Barrack & Mongers Homestead noted). Avon River, Bland's Pool & Mile Pool show. Item426 - York 14D. Plan of part of York Townsite showing Lots 1-12, A1, A2, U, V, Y, W & Y19 (Girls School & Mechanics Institute noted) by A. Hillman and R. Ray [scale: 4 chains to an inch, Tally No. 005904]. Item427 - York 14E. Plan of part of York Townsite showing Lots 101-102 Reserve, 160-188 by W. Phelps. Lots 189-210 by C. Evans [undated, scale: 4 chains to an inch]. Item428 - York 14F. Plan of boundaries proposed for Townsite of York on 7/3/1830. Lots shown in vicinity of Mt Brown, Dyott Hills, Avon River and Bland's Brook [Unsigned]. Item 425 - York 14C. Allotments in vicinity of York by Philip Chauncy. (Lots in vicinity of South & Poole Streets, Court House, Survey Office, Barrack & Mongers Homestead noted). Avon River, Bland's Pool & Mile Pool show. York 14C. Allotments in vicinity of York by Philip Chauncy. (Lots in vicinity of South & Poole Streets, Court House, Survey Office, Barrack & Mongers Homestead noted). Avon River, Bland's Pool & Mile Pool show. Confirm Item Request: York 14C. Allotments in vicinity of York by Philip Chauncy. (Lots in vicinity of South & Poole Streets, Court House, Survey Office, Barrack & Mongers Homestead noted). Avon River, Bland's Pool & Mile Pool show.